It would be difficult to find a Nigerian who has not experienced in some way the bitterness of the bloodshed resulting from the violent conflict between Fulani herdsmen and Kaduna natives. The crisis has been far-reaching and resulted in devastating loss of life in Kaduna and across Nigeria – in fact, the attacks between ethnic groups have outnumbered those carried out by the notorious Boko Haram group. With death tolls increasing on both sides of the conflict, the crisis that stems largely from inefficient resources in a now dry northern region facing rapid population expansion has become widely understood to be ethno-religious by nature. What has been speculated to have started with the destruction of a farm in the Godogodo community in southern Kaduna has since snowballed into the dire situation that poses a challenge the entire country today. The relationship between Fulanis, an ethnic group known for their nomadic lives, and the local natives of southern Kaduna, who have settled and created farmland as the population has grown over the past decades, have seen a series of attacks in the past years in Kaduna State that have resulted in over 700 deaths by early 2017. The continued migration of the Muslim Fulani herdsmen and their cattle have taken them south, away from their familiar territories toward greener and more Christian-dominated communities, where much of the violence is sparked. Thus, to many, the crisis has evolved from being resource-driven to ethno-religiously motivated. As a youth leader in an Aso community in southern Kaduna, Barnabas Samuel is close to the destructive effects that these clashes have caused. He recalls when a youth member in his community named Monday was injured by Fulani herdsmen due to a misunderstanding over land. Monday had been working on his farm when the Fulani youth brought their cattle to graze there; when he protested, he was attacked with a machete, causing permanent damage to one of his hands. Monday’s experience is not the only violence Barnabas and his community have witnessed. In the midst of 2018 Easter festivities just a few months ago, the community held its annual ‘Igabi Festival Day,’ during which youth from neighbouring communities come together to celebrate. Two youth members from his community were attacked and killed, allegedly by Fulani herdsmen, near the Aso Village bridge, which is known to be particularly prone to such attacks. Barnabas and his community, however, are not the only ones suffering from the violence between the nomadic Fulanis and the more settled groups of Nigerians. The Fulanis, themselves, face many challenges and experience great loss from the violent conflict, as well. Ardo Sani is the Chairman of Miyyeti Allah (the Cattle Breeders Association of Nigeria, sometimes called MACBAN) in Kaduna North and the Ardo (“leader”) of Kabala Costain, a neighbourhood in Kaduna State. Those in his community face the same killings and kidnappings across Nigeria, as they have had to move from region to region with their cattle, crossing between those dominated by ethnic- and religious groups that often oppose their own backgrounds and beliefs. He explained that not all Fulanis are part of the evil acts often associated with them, adding that any Fulanis contributing to the violence lack the moral upbringing and true understanding of the teachings of Islam. He believes that many of the attacks are the work of outside groups who want to bring confusion, causing people to see the Fulanis in a negative light so that all ethnic groups will see them as the killers. The citizens of Southern Kaduna blame the Fulani for any attack on their people, while the Fulani people believe that their perspectives and stories remain unheard and ignored. 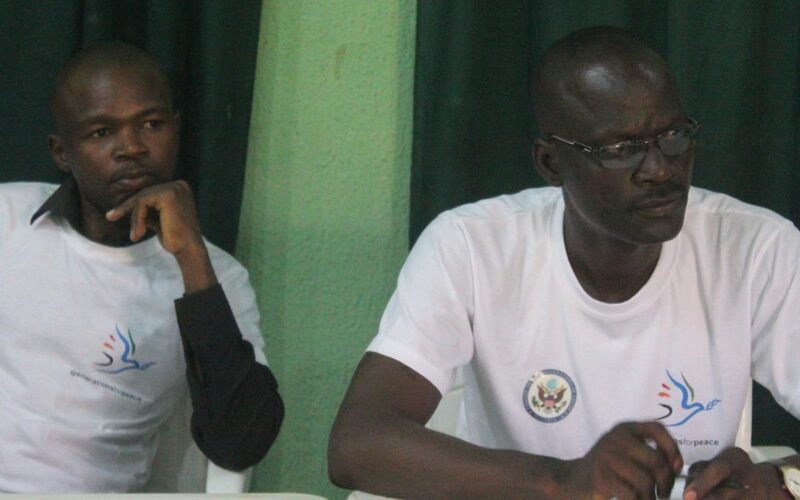 Ardo Sani (right) sits with another GFP Dialogue For Peace participant, representing Kaduna’s south zone in peace. “There is one of our brothers whose cows numbering up to thirty where stolen since three years ago, and up until now, nothing has been done about it. No media is saying anything about it, and those cows are yet to be found. A military officer named Jakob is the only one who has made efforts in helping us out whenever we are being attacked. He gives us locations where we can recover our stolen cows.” This is just one of many incidents facing the Fulani herdsmen that neither the media nor authorities pay attention to, thus evoking negative emotions from the Fulanis, who feel marginalized and uncared for. Luckily, programmes are being put into place across Kaduna State to help bring back the peace that Ardo Sani remembers. Both Ardo Sani and Barnabas Samuel are active members and volunteers with Generations For Peace’s Dialogue For Peace Programme in Nigeria. The Programme and activities provide men and women from all ethnic and religious backgrounds with a safe space in which the peace they once had can be rebuilt – a place where the cultural differences between them can be approached with care and transformed through dialogue. When Barnabas started participating in the Dialogue for Peace Programme, he began to understand people better, getting to know a side of Fulani herdsmen he never experienced before. Similarly, Ardo Sani feels that the programme provides a way for all ethnic groups to express themselves, giving them opportunity to better understand and accept one another, paving the way for developed relationships and enhanced social stability. *This post contains the opinions of the Generations For Peace and is not intended to convey endorsement of the U.S. government in any way.